I recently purchased a few items from Cherry Culture when they were having a 20% off sale. I missed the last one but I figured there would be another one in a month or 2 and I was right! 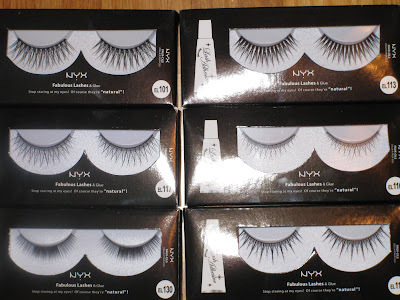 =) For under $20, I received 6 pairs of NYX lashes (glue included), NYX Doll Eye Mascara, NYX Glitter Liner (the one with the tassle), NYX Black Label Lipstick, NYX Diamond Lipstick, and a Styli-Style Brow Pencil. I've been wanting the brow pencil for months and when I finally ordered it, it turned out to be too light! Oh well, the other items were nice. Anyways, how did I receive all this for under $20 WITH free shipping?? Well, I forgot that Cherry Culture has a "Rewards Program"-much like Sephora or Ulta. For every $1 spent, 1 point is earned. Later on, you can redeem your points for store credit. 250 points = $10, 300 points = $12, 500 points = $20 and so on. So basically, ever 25 Points = $1. Soooooooo, I didn't know that I already had lots of points in my account from previous purchases. 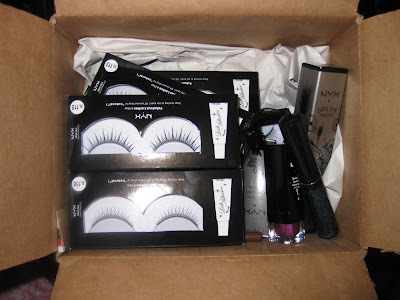 My basket had to have at least $40 (20% promo added + before taxes) to receive Free Shipping. So, I added all these items to my basket at 20% off (with the promo) and was left at exactly $40 and a few cents (you need to spend at least $40 to recieve Free Ground Shipping.) After that, I added my store credit which was over $20. 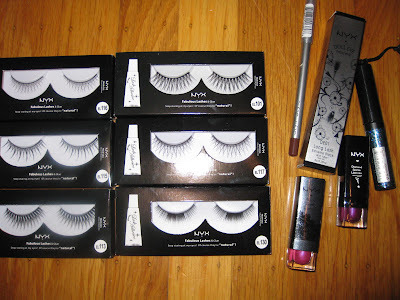 Then I paid the rest on my card and that's why I got all this for under $20! Great deal! If you've shopped at Cherry Culture before, make sure to redeem your points on your next purchase. Also, I always wait for promotions because they have them so frequently so wait for those if you want to save more! Also, sign up for the CherryCulture email subscriptions and they'll send you emails when there are promotions (no spam here either!) 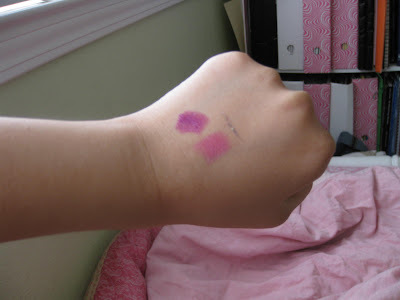 Here are pictures of what I got..
Top is NYX Diamond Lipstick in "Orchid." Very pretty pink-purple color with lots of shimmer. Underneath is NYX Black Label Lipstick in "70s Pink." I expected this to be a bubblegum color looking at the Cherry Culture and NYX swatches bu it was just a normal bright pink -which I already have. That little line on the right is the NYX glitter liner in "Disco Queen" but you can't really see it =\ It's really pretty though, a greyish pewterish dark color with multicolor glitter. I have something similar from MAC but I like this one more because there's more glitter. The only other thing that I REALLY wanted to buy was some LASplash liners. They have really pretty, colorful colors and were placed at a low sale price. I think they had to sell them all to make room for the new liners. These look great also but there's only like 1/4 of the colors they used to offer for the old liners. Click HERE to view the new LASplash liners.